218 S. Main Avenue Sioux Falls, SD 57104 Nourish your mind, body and spirit while connecting with your strength and flexibility through mindful practice. We are pleased to welcome Dawn Kirsch to East Bank Yoga. 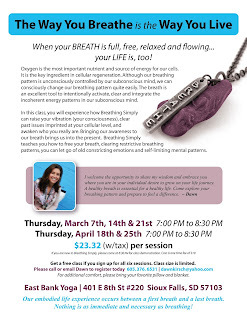 She will be offering a 6 week series focused on conscious breathing, beginning in March. "Breathing Simply teaches you how to free your breath, clearing restrictive breathing patterns, so you can let go of old constricting emotions and self-limiting mental patterns." Students receive a FREE class if they sign up for all six sessions, but are also welcome to choose which classes fit best with their schedules. Please click on the flyer to the left for more details and contact Dawn with any questions. Meditation Group will be held at Blue Mounds State Park Saturday, July 21.We will be leaving Sioux Falls at 1:00pm.Meditation Group fee waived, $5.00 per carload to enter park.RSVP at least one week in advance at eastbankyoga@gmail.com or 605.759.7459 to coordinate carpool.Bring hydration, sunscreen and a sun hat.Artist Greg DenOtter will be providing customized walking stick gifts to participants. Yoga philosophy acknowledges our multidimensional existence, that our being comprises of many layers or koshas, the basics of which are the mental body, the physical body, the emotional body and the spiritual body. 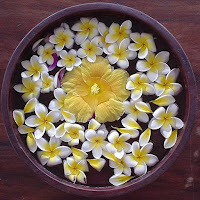 Unfolding to the experience of each of these layers is essential for our health and well-being. Physical yoga practice or hatha as it is called, is important to communicate with our physical body by routinely moving and stretching it. 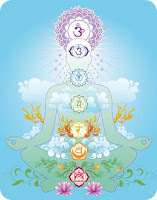 This class will consist of: Introduction to the chakras, a yoga practice pairing asana with chakras, relational meaning of mind, body and chakra. Registration 48 hours prior to class. $25.00 cash or check accepted. Payment required prior to class, eastbankoga@gmail.com, or 605.759.7459 If you are not able to attend class a make-up class will be schedule for you.